Matchmaker Exchange welcomes the chance to work with you. To get started matching a case, see the instructions below. Individual case queries or full datasets may be submitted via any of the portals currently connected to MME. To search the MME for matches, each data querier must adhere to the MME End User Agreement. Entry of a case into a MME database may require consent depending on the content entered. For guidance, click here. To begin querying, choose one of our participating services to deposit your case. Use the charts below to compare the location of the database, the types of data stored by each MME service and the parameters used by each for matching and score output. You may click on each database to be directed to their website for additional guidance and to begin querying. If you have a dataset you'd like to deposit into one of the participating matchmaker services to make available for matching, you may also use the instructions below as a guide. We recommend contacting the database to ask for any special instructions on depositing a dataset. Each Matchmaker Exchange service has defined their own protocol for determing matches. The table below (download here) summarizes how each service determines matches, as well as how users are notified when their query results in a match or their data is matched on. AGHA Patient Archive (Australia) PA uses a joint phenotype-gene similarity approach computed via a linear interpolation of a phenotype and a gene score. The phenotype score is an adaptation of the travelling salesman algorithm applied to phenotypes grouped based on top-level HPO abnormalities (e.g., abnormality of the cardiovascular system, etc). The gene score is an average of the number of genes matched from the incoming candidate into shared patients. Matching / searching triggered from the platform takes place in real time - i.e., results are returned and presented to the user immediately. Incoming matches are notified by email - if the user has ticked the notification box when sharing the case. To get the best matches from DECIPHER, include genomic coordinate information with your patient deposition into the system you are querying from. The scoring algorithm for variant similarity takes into account the VEP consequence, assessing the severity and similarity of the consequence. DECIPHER calls this a functional similarity score. All contact requests made external users, whether using Matchmaker Exchange functionality, or using the advance search functionality on the DECIPHER site, are manually vetted for authenticity before being forwarded. When a Matchmaker Exchange request is sent to DECIPHER, we evaluate all open-access patients and variants for similarity. First, if any variants are given for the patient, we find variants in our system which overlap the same position. If the position of variants are not given, the gene is used as the position. Primarily, genotypic level data is used for matching, falling back to phenotypic data if no genotypic level data is available. For phenotypic similarity, we generate a UI (Union over Intersect) score against every open-access patient with phenotypes, which takes into account all ancestor terms for both the given patient and patients within DECIPHER. When a DECIPHER user uses the Matchmaker Exchange functionality to find similar patients in other systems, the results are immediately shown to the user when received, and they may follow any links or emails returned. Our users are not currently notified. We feel that if the external user found a good match, they will make contact. When an external system wants to find similar patients within DECIPHER using the Matchmaker Exchange functionality, the results include a DECIPHER URL for the patient record. The external user may view all the open-access information about that patient, and make a contact request to the responsible clinician through DECIPHER using our contact request form. GeneMatcher (USA) GeneMatcher allows users to create submissions which contain MIM number, inheritance, genes, variants, and phenotypes. Matches are automatically made when the user saves their submission, and can initiate a match against MME at any time, selecting which MME servers to match against. By default GeneMatcher matches gene identifiers, but users can also include matching on MIM number, genomic coordinates and phenotypes, this can be optional or required. Phenotypes are matched using the Wang overlap coefficient (this is referenced on the GeneMatcher website). Additionally, users can further restrict matching to any or all of researchers, healthcare providers and patients. Notification is done by email with all parties being notified simultaneously. GeneMatcher excludes patients from matching when receiving MME match requests, and does not allow patients to make MME match requests. An email is generated simultaneously to all parties in the match and includes all information matched on. An email is generated simultaneously to all parties in the match and includes all information matched on. Monarch Initiative (USA) The Monarch Initiative MME server operates purely on provided patient phenotypes. The phenotypes are used to compare the patient to model organisms and diseases using the Monarch compare API. Given Monarch contains no patient data, no notifications of matches are sent. Source code can be found at https://github.com/monarch-initiative/monarch-mme The Monarch MME service calls the Monarch Phenotype Analysis service (Human front-end at https://monarchinitiative.org/analyze/phenotypes).The model organism and disease matches are ranked according to phenotype similarity as calculated using OwlSim (owlsim.org). MyGene2 (USA) MyGene2 accepts profile submissions from clinicians/healthcare providers and from patients worldwide. All profiles submitted by clinicians/healthcare providers or researchers are classified by the submitter using a short series of questions. Submissions that describe an individual with a known gene underlying a known phenotype are not shared via MME to reduce noise in the MME network. All other submissions that involve a novel gene, novel phenotype, or phenotype expansion are shared via MME. Family/patient-submitted profiles in MyGene2 are excluded from matching via MME due to current MME rules. MyGene2 currently matches on gene identifiers, with matching on phenotype, MIM number, and other data types planned. When a Matchmaker Exchange request is sent to MyGene2, we evaluate C/R submitted profiles for matching genes using ENSEMBL and HGNC identifiers, as well as (as a fall-back) gene symbols. Matching/searching MME from MyGene2 takes place immediately upon case submission, and all connected nodes are searched. Users can view match results in real-time in their MyGene2 dashboard. Users also receive an email notification (that can be disabled by the user) for each match. Email notifications can also be disabled globally for all cases submitted by a MyGene2 user. MyGene2 users can view match results in real-time in their MyGene2 dashboard and may also receive an email notification (that can be disabled by the user) for each match. The external MME node that sent the query to MyGene2 is provided with data including a link to the matching MyGene2 profile and the name and contact information for the MyGene2 submitter. 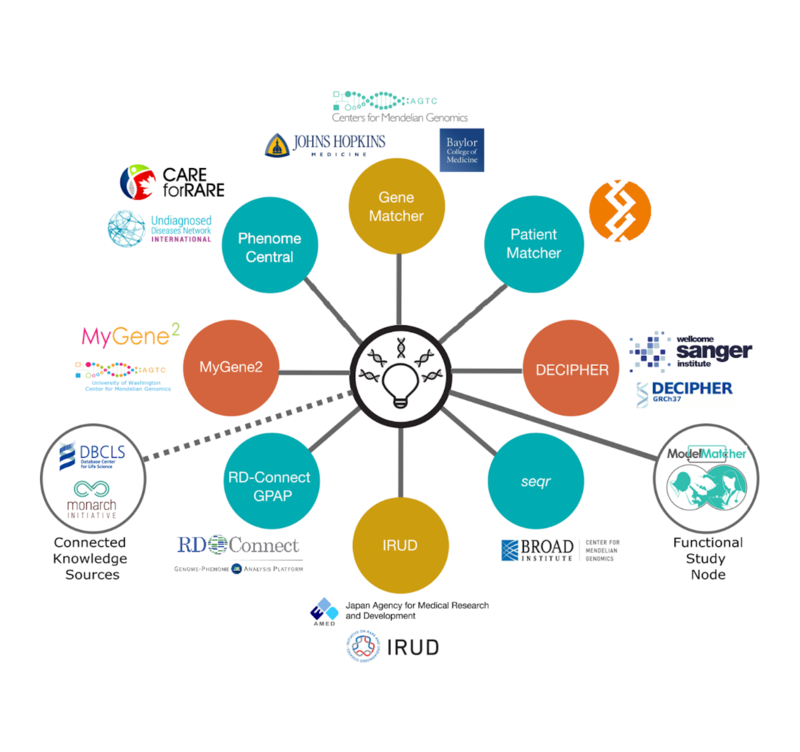 Because all cases submitted by clinicians or researchers to MyGene2 are public, the initiating user can use the link to the MyGene2 profile and determine if the match is worth pursuing. PhenomeCentral (Canada) PhenomeCentral matches on a combination of phenotype, candidate gene, and disorder. First, the database is searched for both the most phenotypically-similar cases and any cases with the same candidate gene. Phenotype searching is done with a lucene query using all induced HPO terms, and the top 50 cases are considered. These phenotype and genotype search results are combined and scored fully, before returning the top 10. The patient score is the average of the phenotype and genotype scores. The phenotype scoring uses simGIC, with a boost if the two patients have the same diagnosis. The genotype score is 1.0 if both patients share a candidate gene. For local matches within PhenomeCentral, exome variants prioritized by the Exomiser are also used for matching. Users can view matching results in real-time within the PhenomeCentral portal. We are currently testing a feature where a Genetic Counsellor will send match requests for all patients, view the matches, and decide whether or not to send an email notification to users. Incoming matches do not currently display within PhenomeCentral or trigger a notification. In the upcoming feature, these incoming matches are shown to the Genetic Counsellor that reviews matches, who will decide whether or not to send an email notification to the user.